So, I want to apologize for the formatting of these write-ups. Being away for holidays means I’m writing on my phone. Transferring from Word to WordPress apparently leaves behind all the formatting. So, I’ll add hyperlinks when I get home. I’ll also be doing the wrap-up once I get back so look for that. I can’t believe we are on the last beer. It’s been a great calendar this year. What’s been fun is looking back at old posts and realizing how much I’ve learned about beer and beer styles. My old posts seem a bit goofy. Our last beer comes to us from White Pony Microbrewery located in Padova, Italy. White Pony was founded as an experiment for an Italian son of an Italian-Belgian family. Unable to find a job that would meet his need for experimentation, creativity and knowledge, he decided to create on for himself. They entered their first beer, prophet bourbon réserva, into the Kerst Bier festival in 2013 and placed in the top 10. In 2014 they entered the beer we have today, December Flower, and three others into the same competition that were all rated in the top 50 Italian beers. They’ve continued to win medals and awards for their beers and have continued experimenting and growing their styles. Now producing 18 beers they continue to experiment with limited release beers and seasonal trying to push their creativity and build their brewing knowledge. 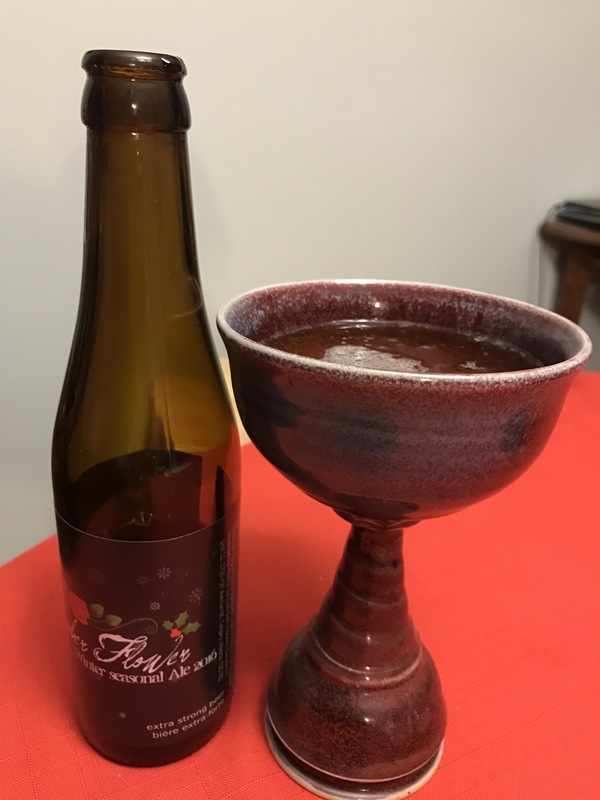 December flower is a Belgian golden strong ale brewed with a lot of candies sugar, orange peel, and two strains of yeast. It is then dry-hopped and a second addition of orange peel and coriander is added. Combined with the yeast waters this beer is meant to bring big fruity flavours and a nice warming quality for the cold winter nights. Belgian Golden Strong Ales are pale, complex, effervescent and highly attenuated Belgian styles of beer. They bring big fruity notes along with hoppy notes and phenolic from the yeast. Interestingly, there are many references to the devil in he naming of this style of beer. This is due to the high alcohol content and a tribute to the original example of this style (Duvel). The best examples are highly complex and delicate with the carbonation bringing out the flavours. I’m excited as it’s the last beer and I’m hoping it’s a delicious one. Appearance – Pours a golden effervescent colour with no head. Smell – Floral notes, orange, yeast, candy sugar and subtle coriander. Taste – sweet candy, orange, subtle coriander and pepper note with an alcohol warmth. Mouth feel – effervescent, light bodied with an alcohol warmth on finish. Overall – Good Belgian style strong ale. Flavours are nice and fruity with a good alcohol warmth. The champagne yeast brings an effervescence which makes some of those fruit notes pop. Do I like it? – I did. It was nice and fruity and crisp. Good alcohol warmth and nice candied notes. Overall a good finish to the calendar.